I still use the needle case my Mum made me when I was way way back in my teens, if I didn't I am sure I would lose so many more sewing needles than I do! Inspired by the one she made I have designed this felt version. 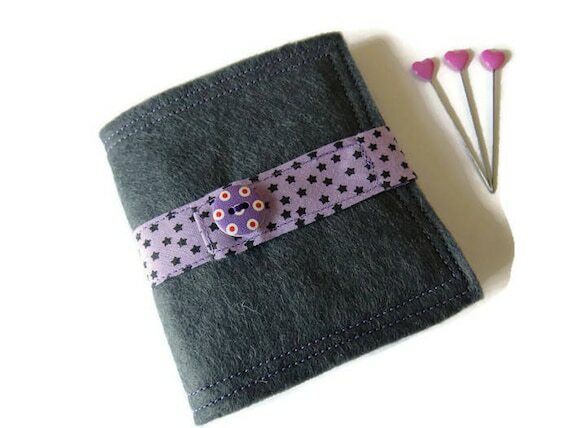 Created in 2 layers of premium wool blend felt containing 40% wool and 60% viscose, the top layer is Charcoal Grey, the inside is Light Purple there is a layer of wadding to give the needle book body and stability. Have pinked the edges of the inside pages. The book closes with light purple binding with tiny black stars which wraps around the case and closes it with a snap fastener. There is a cute little polka dot button decoration on the ribbon. The book measures: 3.5ins x 3.75in (9cm x 10cm) approx. Folksy :: Buy "â™¥ Vintage Feedsack Needle Book â™¥"
Folksy :: Buy "Needlebook in Yellow & Orange"